Crew Skills has retired! Keep reading me over at Siha Games!, my general MMO blog. You know, I’ve been so busy a) making Google Docs spreadsheets (it’s a compulsion, I tell you!) and b) actually playing the game, that I haven’t actually talked about what I’m playing! Let’s rectify that. Siha here is my main; she’s a Commando, currently specced into Combat Medic. Which was inevitable, really; heavily-armored healers seem to be my thing. And beyond that, I love military sci-fi, and the female trooper is voiced by Jennifer Hale. How could any other class compete? Siha’s currently sitting at level 46 – I’ve been stopping to smell every flower I can find, and I’ve been further slowed by a deluge of RL stuff – and I’m ambivalent about the light at the end of the tunnel. On the one hand, I’m looking forward to what level 50 has to offer; on the other hand, I don’t want Siha’s class story to finish! I’m really, really loving the Trooper class storyline. I haven’t experienced much of the other classes yet, though they do seem fun from what I’ve played so far, but Trooper is just great. It grabs you and gives you a reason to get really invested right from the start, and just doesn’t let up. Zushan is my Jedi Shadow. She’s young and passionate and generally a good person, even if she finds the Jedi Code a bit of a challenge at times. 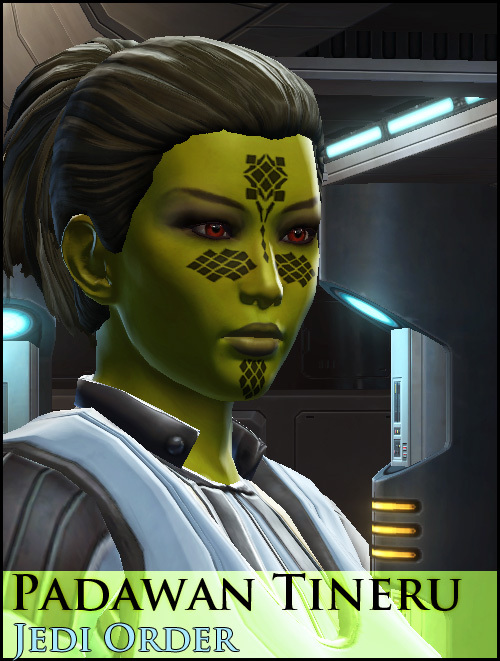 Tineru is my Jedi Knight, and I’m currently torn between Sentinel or DPS-specced Guardian for her advanced class, though I’m leaning towards the latter. She’s peaceful and calm where Zushan is headstrong, but I don’t have a clear sense of her personality yet, so she’ll be sitting on the backburner for a bit yet. Of course, all the other Advanced Classes look like oodles of fun as well, and in some cases (notably Sage and Scoundrel) they seem radically different from the other AC available to the class, so I’ll definitely be trying out everything in the long run. I was a bit put off by the duplication, though — not the class-quest duplication, as let’s face it, I’ve been playing other MMOs for a decade and I’m used to doing the same thing over and over again. No, what I found offputting was the idea of trying to differentiate my second AC from the first one on a character basis, short of having one Light and one Dark side in every class pairing (which felt a bit artificial). I’ve found the combination of voiceovers, animated quest dialogues, and quest choices to be immersive enough that my characters are distinct, to me, and a second one of any class risks feeling very much like a retread. Then I hit on the solution: my second character for each class will be male! This means the voice acting will be totally different, and they’ll have different romance options and thus different relationships with their companions. Because Jennifer Hale’s voice acting might be awesome, but listening to it for another fifty levels would just make my second trooper feel like a pale copy of the first, instead of a cool character in their own right. This way I can have my cake and eat it too. 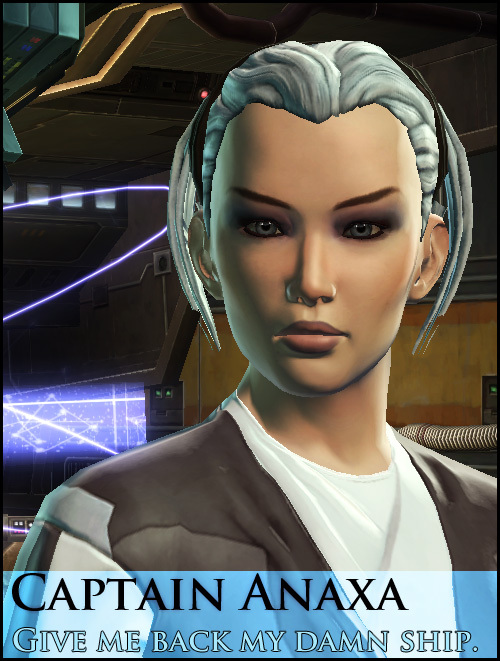 Most crafting schematics in SWTOR require the addition of fairly generic “crafting materials”, which you can buy from a Crew Skills Trade Vendor in various locations (such as in the vicinity of most crafting trainers, and a few other places besides). These materials can also be provided by the same gathering skill that supplies crafting resources – for instance, Cybertech, Armormech, and Armstech all use Fluxes, which can be obtained from Scavenging missions. At low levels, these missions seem like a bad deal. They’re far more expensive than simply buying the material from the vendor, and it’s only worth doing them if you’re miles from a crew skills trade vendor and you want to craft an item right now. That makes it very easy to simply look past all of these missions even at higher levels – and that’s a mistake. The lower missions may not be cost-effective, but the higher-level missions certainly are. As an example, a single Thermoplast Flux costs 400 credits from a vendor – or as little as 63 credits if you choose the right kind of missions. Read on for more about vendor mats missions with gathering skills. From Emmanuel Lusinchi, one of the devs. This still doesn’t solve the issue that crafted gear isn’t comparable to Operations drops, which makes crafting a lot less relevant and useful at endgame, but at least it restores the system to the flexibility players expect after levelling through fifteen planets with moddable gear. There’s an interesting debate raging in parts of the tech blogosphere at the moment, about the wisdom of courting commenters and whether bloggers might be better-served by switching off comments altogether. Many of the arguments for and against are neatly summarised in Matt Gemmell’s post Comments Commentary, but in brief: the no-comments argument seems to be that it encourages people to write more considered, interesting responses on their own platforms rather than commenting on other peoples’ posts. It encourages people to form their own voice, instead of diluting it in the comments sections of a dozen different blogs. That’s all well and good, as far as it goes – and look, it’s worked; Matt Gemmell’s comments-off policy has prompted me to write my own post in response, instead of merely commenting on his. However, this is probably the only time I’ll ever make a post in response to one of his, regardless of how many I read, and how many I’d comment on if he were a comments-on blogger. Because I may write a blog, but it’s not a tech blog – it’s a gaming blog. 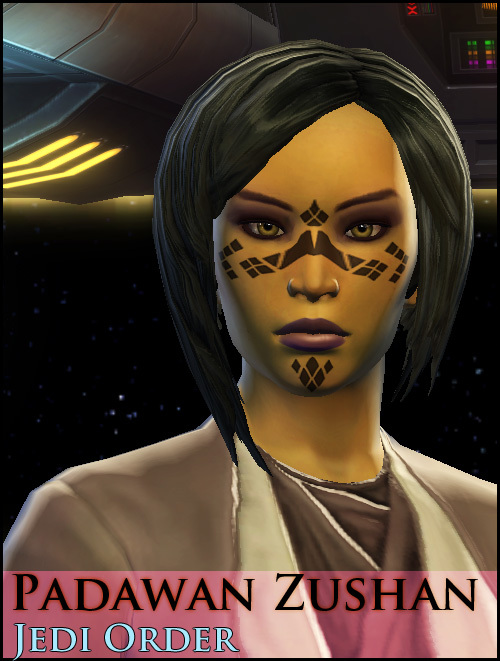 Crew Skills would quickly lose focus if I blogged about tech interests as much as SWTOR. Only A is an appealing choice, and it’s prohibitive in terms of time requirements for people who are already active in other blogospheres or online communities. The implication is that comments-off bloggers are only interested in talking – by means of blog posts – with other people who are as involved as they are, and casual voices are relegated to the sidelines. The Craftable Item Modifications Spreadsheet, in Google Docs. It lists the stat values on each rank of craftable item mods – Armoring, Barrels & Hilts, Mods, Enhancements and Crystals – and the level at which you can use them. It’s still missing a few values for prototype and artifact-level items, and the top two tiers of Enhancements, but I’ll add those as soon as I have confirmed in-game numbers for them. As I posted a week ago, Slicing is still profitable post-nerf. It’s just no longer a license to print money, and has more risk involved. A ratio of 1.0 means that your rewards average out to equal the cost of the missions. A ratio of 1.2 means that for every 1000 credits you spend on missions, you will – on average – receive 1,200 credits from lockboxes. Moderate-yield missions score surprisingly well – this is usually because they’re very cheap to perform. Equally, Rare missions aren’t worth doing for most classes (except 5). This is because they’re usually a huge increase in cost, and they often don’t pay much more than the lower-yield missions. Class 1 and 2 Moderate missions are very profitable, but they’re fairly fiddly given that you have to tend to your companions every few minutes. You can see the data set I accumulated in this Google Docs spreadsheet. All Slicing missions were performed after the Patch 1.0.1 nerf. All missions were performed at 400 skill. All missions were carried out with companions under 1,000 Affection, and none of them had any bonuses to Slicing. There were no mission failures. Some missions were crit successes; you can see these in the dataset with Large boxes listed as the reward. The value of other rewards (schematics, augments, mission unlocks) were not included, only the credits from the lockbox. Every mission was done 10-15 times, except unlockable missions. They’re included in the dataset for reference, but not included in the table. Some missions are unrepresented: these are Imperial-only missions. There are some factionally-split mission pairs which are identical in cost and yield and time – I’m assuming their profitability is equivalent too. There wasn’t enough data to say anything conclusive about unlockable missions. My suspicion is that they’re probably worth doing for the extra goodies, credits aside. You may also want to take a look at this Google Docs spreadsheet (provided by pdxmarcos on the official forums) which has numbers on Average Credits per Minute. I’m not including that data in this post as it’s directly affected by companion affection, but you can find some useful numbers there. 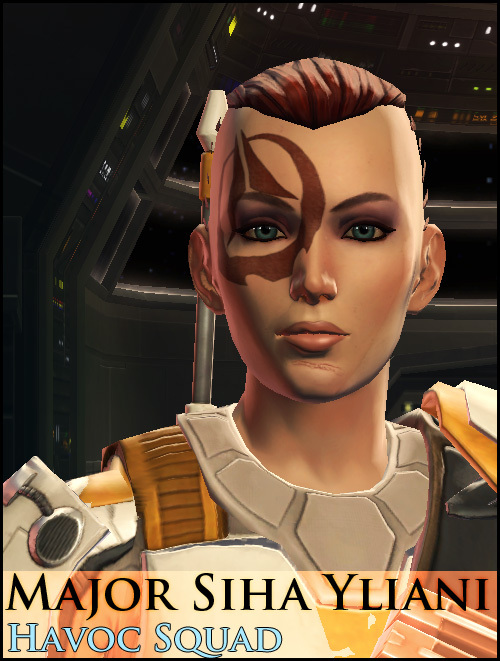 Well, in SWTOR it is, anyway. Many MMO players succumb to a kind of colour-blindness, where one ignores items if they’re not green, blue, orange or purple. This leads one to ignore the standard-quality items sold by vendors as being beneath one’s notice. If you’re a victim of this MMO Colour Blindness, you might have looked past the consumables sold on every planet. The medpacs and stims sold by the ubiquitous medical droids are well-known, but what about the food and drink sold in cantinas? Next time you’re out doing missions, check in at your local cantina. The cantina vendors & bartender NPCs sell consumable food and drink. The food isn’t terribly useful; it increases your out-of-combat health regeneration, but everyone has an ability that takes care of that just fine anyway. The drink, on the other hand, is well worth stocking up on. It buffs your Presence stat, which increases your companion’s health, damage done, and healing done. And the buffs are nothing to sneer at; they’ll make your companion significantly tougher and more useful, which makes questing and soloing much smoother. Look for Comet Ice Water, Spiced Nerf Milk (mm, tasty? ), Spacer Juice (freshly squeezed from real spacers! ), Holiday Specials, the ominously-named Huttese Hangover, or Chilled Corellian Cocktails. You’ll find them in cantinas in level-appropriate areas, and the bartenders on Carrick Station & Vaiken Spacedock sell the level 40 Corellian Cocktails. This thought was prompted by a line in a post over at Going Commando, where Shintar points out that “daily quests … are designed to make you repeat them“. Many SWTOR players are familiar with World of Warcraft, and describe SWTOR’s features in a context that other gamers will understand – and so heroic quests become “dailies”, because you can repeat them every day and that’s the shorthand that former WoW players will understand. Technically true, but – as Shintar says – I think comparing them to WoW dailies is misrepresenting them somewhat. In WoW, daily quests really are designed to be a grind; you don’t get anything worthwhile until you’ve done quite a few days’ worth in succession. In almost every case you’re grinding for tokens or factional gains, and you’ll need to repeat the same dailies (often half a dozen quests or more) for a couple of weeks before seeing any reward. 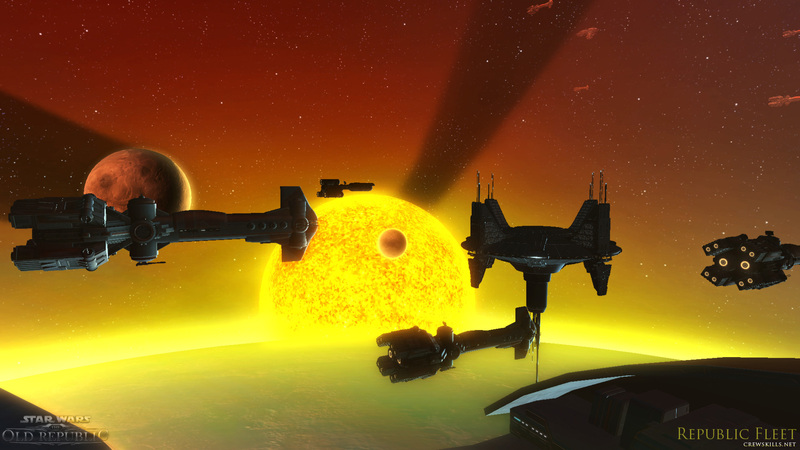 In SWTOR, “dailies” are just quests that you can repeat for extra rewards if you choose. However, they provide meaningful rewards – commendations, moddable gear, random loot boxes, or credits – with every repeat, so you’re not roped into a tedious multi-week grind just to get any value out of one day’s worth of quests. Commendations are arguably an investment rather than an upfront reward, but there are so many ways to get commendations it’s far from a grind. This might all change at endgame, of course – but as far as the levelling game goes, I find I much prefer SWTOR’s approach to repeatable content. Well, the game’s been live for less than two weeks and already they’re nerfing things! Rewards from Slicing have been reduced to bring them into balance with other skills. Adjusted incorrect values for medium slicing boxes. Cue lamentations, weeping and wailing from everyone who’d recently hopped aboard the Slicing gravy train, especially with alts levelled for the purpose. Fear not, however; Slicing missions do still seem to turn a profit. I’m tracking each mission’s results and I’ll present a statistical analysis once I’ve got a better sample size, but I’m about 20K in the black after about forty missions this morning. That’s not a great return, although I’ve been doing more of the low-level and low-yield missions to start amassing statistical data. So far, the Rich Yield missions in Class 5 seem to give much better returns than anything else, but don’t take that as hard truth until I’ve got enough numbers to draw reliable conclusions. Edit: I’ve shared my findings and dataset in the “Slicing Profitability” post. Things have been a bit quiet around here lately, what with the silly season being upon us, and the launch of the game itself – I haven’t had a moment to spare, and I imagine neither have most of you. If you explore a little, you’ll find that Carrick Station isn’t the only part of the Republic Fleet you can visit (and, for the Imperials, neither is Vaiken Spacedock). There are wonders to be seen out there. And I’d like to take this opportunity to wish a Merry Christmas to those who celebrate it, and a festive holiday season to everyone. Stay safe, keep on playing, and I’ll see you all in the New Year!